Hoe-down! Look what ‘just blew in from the Windy City’! 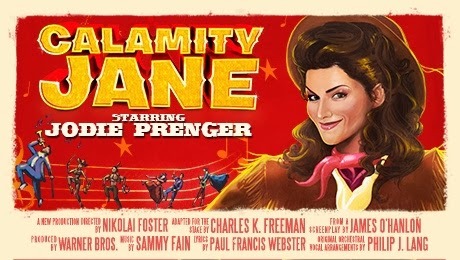 Only the Watermill Theatre’s whip-cracking production of the terrific 20th Century musical staple, ‘Calamity Jane’! Therootin’-tootin’ heroine bursts into the Edinburgh Playhouse with thigh-slapping gusto as she embarks on the second phase of her national tour. Adapted for the stage from the 1950’s Warner Brothers movie starring Doris Day and Howard Keel, the script features all the tropes of its screen counterpart – gender stereotyping, curiously old-fashioned humour and a cracking song about just how gosh darn brilliant women are at cleaning up! Not an orchestra in sight, the curtain rises to reveal the cast of multi-talented actor-musicians who skilfully accompany their co-stars (on numerous instruments) throughout the course of the show. A common trademark of any Watermill production, the actor-muso element works a treat in the touring revival, giving a new dimension to the classic narrative. Leather chaps off to Rob Delaney as Francis Fryer, whose piano playing and infectious characterisation brings an old fashioned zest to the production, while accomplished violinist Christina Tedders, achieves a similar panache as she doubles up as burlesque diva, Adelaide Adams. Undeniably however, the star of the show is head-liner Jodie Prenger who ticks all the boxes as sharp-shootin’ ‘Calam’ and dusts off any preconceived ideas about a reality show winner by giving life to the script’s thin stretch of a character. Prenger fully embodies the role to the extent that you can't help but imagine her wandering the street with a gun, ready to stop fights and save society with a song. Indeed, her voice is as warm as a Wild West sunrise, and you’ll never have heard Secret Love performed in a manner quite as honest or gutsy. Elsewhere, soap star Tom Lister is dependable and a pleasure to watch as leading man, Wild Bill Hickok. His intimate rendition of the classic melody Higher than a Hawke proving a particular highlight. Likewise, Phoebe Street’s delightful yet ambitious Katie Brown gives just the right amount of old-world womanly charm albeit viewed through a modern day lens, while the supporting cast add quintessential character colour in the overall progression of the production. Pulling all the horses together is director Nikolai Foster, with slick yet inventive transitions (the piano-come-stagecoach movement proving an acutely clever moment) and softening the more politically-incorrect tones for a 21st century audience, while utilising the theme from Matthew Wright’s magnificent set design to really invoke the dust-strewn Golden Garter Saloon of the wild frontier. Wright’s meticulous attention to detail provides a truly authentic 1876 Wild West experience while Nick Winston’s choreography expertly uses the limited stage space and brings a dynamic vibrancy to the high-kicking hoe-down numbers, allowing supporting players Matthew James Hinchcliffe and Martin McCarthy the opportunity to further showcase their quadruple-threated talent!